Using Ukrainian prepositions with cases might be confusing at first and will take time to practice, but with the right tools and reference materials, you will master them like any other grammar rule. That is why I decided to create this table below to give you the opportunity to see the whole picture of the Ukrainian prepositions with cases, as well as the context to understand how to use them better. If you are not familiar yet with the concept of cases in Ukrainian, check out our article “Introduction to Cases in Ukrainian language”. 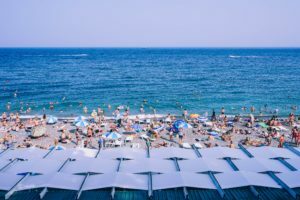 Ми зараз в поїзді і їдемо на море. 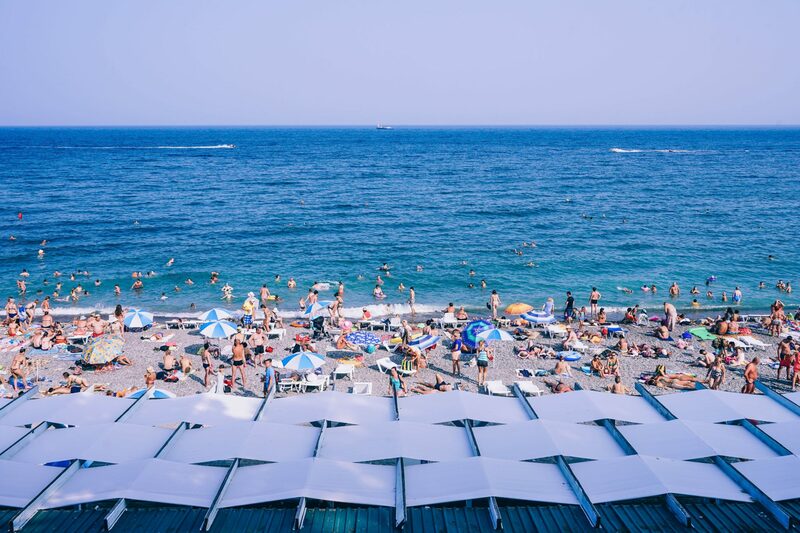 Ми зараз на морі, в Криму. You can find the prepositions that can be followed by different cases in a separate table in the bottom. без without Я п’ю каву без цукру. – I drink coffee without sugar. (a person) Я отримала повідомлення від Павла. – I received a message from Pavlo. для for Це – подарунок для мами. – This is a present for mom. up to Ми їдемо до Львова вранці. – We go to Lviv in the morning. Я буду в офісі до вечора. – I will be in the office until the evening. Ми вирішимо цю проблему до середи. – We will solve this issue by Wednesday. На концерті було до тисячі людей. – There was up to a thousand people at the concert. після after Після вечері ми ходимо на прогулянку. – After dinner we go for a walk. opposite Я не маю нічого проти нього. – I have nothing against him. in front of Навпроти церкви ви побачите парк. – In front of the church you will see a park. серед among Серед його друзів є багато українців. – Amond his friends there are many Ukrainians. навколо around Навколо нашого будинку є багато магазинів. – Around our house there are many shops. з from Ігор їде на машині з Житомира. – Ihor is driving from Zhytomyr. заради for the sake of Заради свободи ми готові боротися. – For the sake of freedom we are ready to fight. у, в possession У тебе є кіт?- Do you have a cat? В Олега є син. – Oleh has a son. To get more practice of using genitive case with prepositions, listen to the Ukrainian Lessons Podcast episode #48: Eating habits + Genitive case. завдяки thanks to Я п’ю каву без цукру. – I drink coffee without sugar. всупереч contrary to, despite Всупереч її пораді, він купив стару машину. – Contrary to her advice, he bought an old car. Want to know how to use Dative case in Ukrainian? Start with the Ukrainian Lessons Podcast episode #51: Electronics and technology + Dative Case. on (days of the week) Поклади це в коробку. – Put this in the box. Вони приїдуть в Ужгород у понеділок. – They will come to Uzhgorod on Monday. on, onto Ми йдемо на концерт вечері. – We are going to the concert tonight. Поклади це на стіл. – Put it on the table. про about Цей фільм про Другу світову війну? – Is this movie about the Second world war? 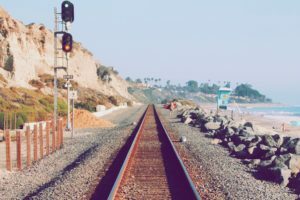 по for (object of motion) Тато пішов по воду. – Dad went to bring some water. in (time) Нам треба перейти через дорогу. – We need to go across the street. Через погоду ми залишились вдома – Because of the weather, we stayed at home. Через тиждень я буду в Києві. – In a week I will be in Kyiv. замість instead of Оля буде працювати замість (за) тебе. – Olya will work instead of you. під under (direction) Іграшка впала під стіл. – The toy fell under the table. Listen how to use the Accusative case in context with the Ukrainian Lessons Podcast episode #57: Your schedule in Ukrainian + Accusative case with prepositions. з with Я п’ю каву з цукром. – I drink coffee with sugar. між between Він живе між парком і школою. – He lives between park and school. за behind, after За нашою школою є садок. – There is a garden behind our school. Іди за мною. – Follow me. (Walk after me). on (object of work) Над диваном висить картина. – The picture is hanging above the coach. Зараз ми працюємо над граматикою. – We are working on grammar now. before Перед театром є затишна кав’ярня. – There is a cozy café in front of the theatre. Я дуже хвилювалася перед співбесідою. – I was very worried before the interview. під under Вони сидять під деревом. – They are sitting under the tree. 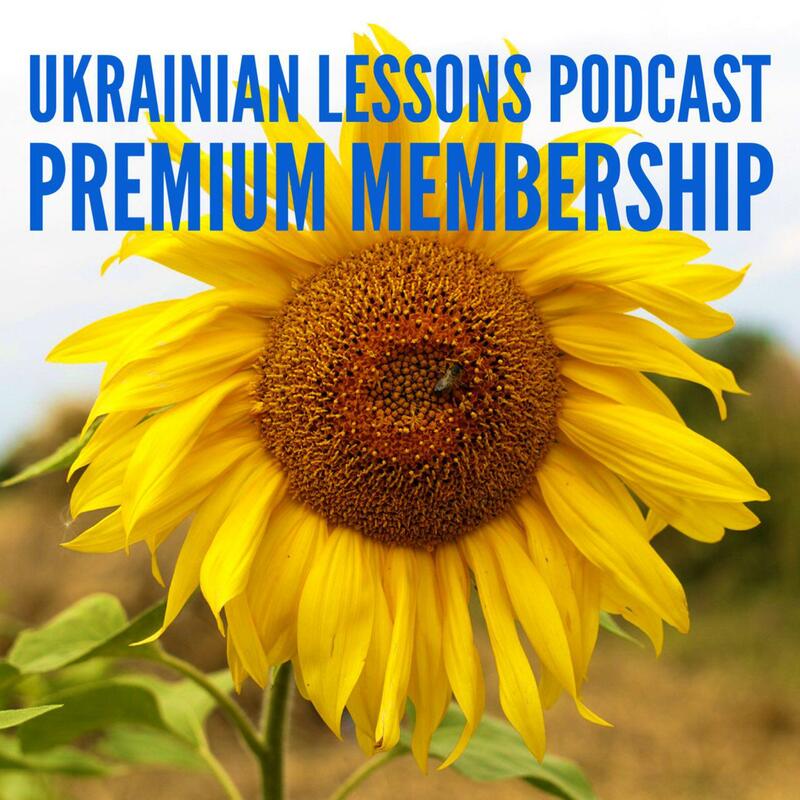 Discover the Ukrainian Christmas dinner menu and the Instrumental case by listening to the Ukrainian Lessons Podcast Ep. 61! у, в in, at Я живу у Львові, в Україні. – I live in Lviv, in Ukraine. Ми зараз в школі. – We are at school now. на on, at Книга лежить на столі. – The book is on the table. Я зараз на концерті. – I am at the concert now. при by При вході в хату росте вишня. – By the entrance to the house, there is a cherry tree growing. по along, around (motion along the space) Я йду по вулиці Лесі Українки. – I am walking along the Lesya Ukrainka street. о at (hour) Ми зустрічаємося о сьомій годині. – We meet at 7 o’clock. Learn the difference between prepositions у, в, на for location and destination and practice the Locative case in the Ukrainian Lessons Podcast episode #66: Sharing memories + Locative case with places. у, в possession + G У тебе є кіт?- Do you have a cat? В Олега є син. – Oleh has a son. days of the week + A Поклади це в коробку. – Put this in the box. static location + L Я живу у Львові, в Україні. – I live in Lviv, in Ukraine. на direction, motion + A Ми йдемо на концерт вечері. – We are going to the concert tonight. Поклади це на стіл. – Put it on the table. static location + L Книга лежить на столі. – The book is on the table. під direction, motion + A Іграшка впала під стіл. – The toy fell under the table. Ходімо за школу, в садок. – Let’s go behind the school, to the garden. static location + I Вони сидять під деревом. – They are sitting under the tree. За нашою школою є садок. – There is a garden behind our school. з from + G Ігор їде на машині з Житомира. – Ihor is driving from Zhytomyr. with + I Я п’ю каву з цукром. – I drink coffee with sugar. Learning Ukrainian and looking for more great resources? Check our 1000 most common words in Ukrainian with the interactive flashcards. Also, you can learn Ukrainian step by step wherever you are with our free Ukrainian Lessons Podcast.